He will rule the night and destroy the world. "I'm going home. Back to where I left my humanity behind. As dark forces target those around me, all I can see are old enemies and scores to settle. I'm on the verge of self-destruction. But I won't go down alone..."
Darren O’Shaughnessy was born on 2 July 1972 in London. After starting school at the age of three, he moved to Limerick with his parents and younger brother. He went back to London to study Sociology/English at college. Darren worked for a cable television company for 2 years before setting up as a full time writer. He had his first taste of literary success aged 15 when he was runner-up in a television script- writing competition with a comedy script titled, ‘Day in the Morgue’. Darren completed his first book aged 17. A big film buff, he also reads lots of adult- orientated indy comics. Other interests include long walks, outdoor swimming, watching and discussing football, scuba-diving . . . and dreaming up new ways to terrify his readers! 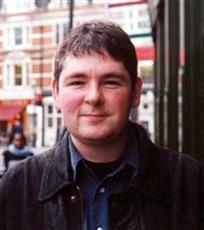 The sixth book in The Saga of Darren Shan, The Vampire Prince is published in February 2002.